For film lovers, it is the year of BRINGING UP BABY, ALEXANDER NEVSKY and THE LADY VANISHES. At the same time, it was anticipating the great year of 1939. In Japan, however, it was the year with few notable works. Sadao Yamanaka was drafted to military the previous year and died in China in September of 1938. 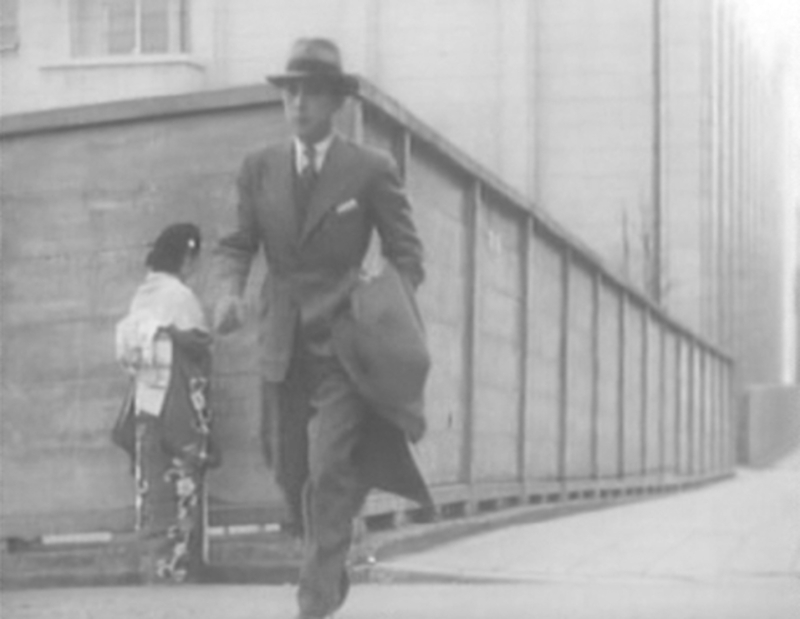 Yasujiro Ozu was also drafted. Mikio Naruse and Kenji Mizoguchi were struggling with minor works. But Japanese movie-going public at the time saw the most phenomenal film of the prewar era this year. In terms of popularity, no prewar Japanese film would beat this film. Directed by Hiromasa Nomura, starred Kinuyo Tanaka and Ken Uehara, it was the box-office record at the time, and the sequels were hurriedly prepared. The film was AIZEN KATSURA. In terms of genre, AIZEN KATSURA (1) was a perfect combination of mother genre, suffering woman genre and lovers-missed-each-other-by-a-minute genre. A perfect combination of popular genres at the time. In addition, a title song played a critical role in film production and sales in late thirties. AIZEN KATSURA’s title song, TABI NO YOKAZE, has become an I WILL ALWAYS LOVE YOU of the prewar Japan. If I may make its insanely complicated plot to something tangible one, it is a story of a single mother, a nurse, who falls in love with the son of the hospital owner. But his family is not friendly to her, so they try to elope. But at the last minute, her child becomes so sick that she cannot show up, and he thinks he was dumped. Ashamed, she leaves the hospital and many forms of agony ensues. Then she composes a song, which becomes a instant national hit, and she sings the song in front of enthusiastic audience in a nurse uniform… ah, never mind. To modern viewers, its production, direction and acting are all mediocre, sometimes below standard. Shochiku should have done better. The usual troops of Shochiku actors do not look comfortable in their characters here. Sometimes, their facial expression do not match their words or actions. Shooting locations look like streets next to the studio. Interiors are as uninteresting as exteriors. Flat lighting, mundane compositions and unimaginative direction. This is testament to the industry’s wisdom that cinematic art has little to do with box office (2). Everyone says 30s was the golden age of Japanese cinema. All the major directors created their early masterpieces during this decade. But AIZEN KATSURA was THE movie at the time. Apparently many contemporary directors had mixed feeling toward the film. In one of the interview around this time, Ozu said “What’s wrong with AIZEN KATSURA?”, indicating many film directors found everything is wrong with the film. Kougo Noda, the frequent Ozu collaborator and the creator of such memorable films as CHORUS OF TOKYO, A WOMAN OF TOKYO, and TOKYO STORY, wrote this absurd screenplay. The film’s director Hiromasa Nomura himself may not be as innovative nor creative as other auteurs of the era, but his earlier films do have cinematic moments, in terms of composition, camera work, narrative flow and direction. HITOZUMA TSUBAKI (1936), the film Nomura directed two years earlier, has Murnau-like images of fire and water in the night. Probably the strongest asset in the film is Kinuyo Tanaka. She is as good as anyone can get in this film. On the other hand, Ken Uehara, the male lead, is wooden and almost irritating to watch. No wonder, since he first turned down the role saying he would never be able to act in such an absurd story. Nevertheless, Shochiku made him do it. Not only once, but twice, three times and four times. Throughout his life, he maintained that the whole story was ludicrous, and hated the film. Ironically, this was the most successful film in his career. All being said, here is the problem. We, more than seventy years later, are left only with the incomplete version of the film. The two-part original AIZEN KATSURA was released in 1938 back to back and two sequels ZOKU AIZEN KATSURA (1939) and AIZEN KATSURA KANKETUHEN (1939) were released. According to the records, four films total more than 4 hours. But the version we have now is the digest of the film, probably was edited after the war to 89 minutes long (3). Then what are we looking at ? When we are looking at an “incomplete masterpiece” (say, GREED), we are always comfortable, discussing the missing pieces would make the film better. But what will be the prospect of an “incomplete mediocrity” getting better if the complete version is suddenly found? Is the film absurd because the incoherent butchering made its narrative flow disrupted? Are many critical scenes missing? If we have more footage, might we like it, or at least understand why it was such a popular movie? Think about this. The year is 2070. They only have the 90-minute version of THE TITANIC. That is the only print survived (which, by the way, almost certainly not likely). DVD and BluRay are all destroyed by, say, evil robots. Will our grandchildren understand why it was such a big box office hit? Will they be able to correctly judge the film as … as it is? Probably not. Then, we are left with an open question. What are we looking at? Why did they like the film so much? It is certain that this film had such a tremendous impact on Japanese psyche at the time. When I was a kid, there were many old folks who fondly pronounce the word “AIZEN KATSURA” whenever they talk about their favorite films and actors. Tadao Sato describes a story about a teenage boy (4), whose dream was to become a soldier to fight for the Emperor. He saw this film, and suddenly realized there are more important things in life other than becoming a fighting soldier. What is wrong with falling in love with a girl? What is wrong with dedicating his life to love instead of to the Empire? He quietly abandoned the path to a military school, and went on to a regular high school, then collage. He became one of the most influential historian in post-war Japan. Daikichi Irokawa, Professor Emirtus of Tokyo Keizai University and Invited Professor in Princeton University, says he is now thankful of this melodrama. After the war, there are four more remakes, starring Machiko Kyo (RASHOMON) in 1953 version, and Mariko Okada (RENGOKU EROIKA) in 1962. None of them being a notable work in Japanese cinema, but they were popular nonetheless. (1) Aizen Katsura is the tree of Katura (“Japanese Judas Tree”) in Jisei-in, Yanaka, Tokyo. This tree is located near the small shrine of Aizen Myoujin, the god of marriage. (2) Siro Siroto, the director of Shochiku at the time, seeing the opportunity for further exploit, ordered Yasushi Sasaki to film AIZEN TSUBAKI (1940). Sasaki read the (supposedly awful) script and protested, in vain. In later years, Sasaki reminisced the film saved his career. It was a hit. (3) The note prepared by MOMAT suggests that this 89-minute version is the digest of all 2-part original and two sequels. However, as far as I could gather, this version does not contain any element of the plot from the two sequels described in various sources. In any event, none of the original theatrical releases is known to exist.